december 6/18 word + Music commemoration. all welcome. Commemorating the 25th anniversary of École Polytechnique massacre in Montreal, the 14 beams of light on Mount Royal represent 14 women murdered for daring to study engineering. Image Rémi St-Onge, Moment Factory; names added by Artists of the Aurora. Join ARTISTS OF THE AURORA members Aruna Antonella Handa and Surkhab Peerzada as they commemorate Dec 6 1989 at the Ecole Polytechnique in Montreal where fourteen women were murdered for daring to study engineering. Centre for Social Innovation - Annex, 720 Bathurst St., Ground floor lounge 12 noon. All welcome. Free. Image by Artists of the Aurora, Victor Klassen, Shelina Knight and Noah Handa-Kipphoff. Have You Seen My Sister? is an aural installation for unaccompanied voice. Divided into 15 minute quadrants, each of which is divided into four songs, the piece builds a human voice memorial to the missing and murdered women and girls of Ontario, of Canada, of the world. the cycle contrasts the hopeful voice at the beginning of a search with the doleful one as the search wears on. In the second movement, soloists sing the names of the missing as if calling for them. In the third song, singers ask to be reminded to wonder who is missing from the corridors of privilege because it is these women who are found in disproportionate numbers on the missing and murdered lists: Indigenous women, women of colour, women living in poverty and transgender women. In the final song, the names of the murdered women and girls are recited, with the company sings “gone, gone”, like funeral bells tolling. Have You Seen My Sister? was composed Dr. Aruna Antonella Handa, a musician in Toronto, who is Artistic Director of Artists of the Aurora. Currently the collective is raising funds to record the song cycle and to tour the province of Ontario with it. To contribute, please visit here. The image for 'Have You Seen My Sister?' started with a painting by Artists of the Aurora collective member Victor Klassen. Design members Pat Vandesompele, Noah Handa-Kipphoff, and Shelina Knight added text to create an image that evokes missing posters. The missing in this poster is Everywoman. She carries the world on her shoulders. The image draws connections among the phenomena of missing and murdered women in Canada and throughout the world. Indigenous women, women of colour, women living in poverty, trans women: it is often the most disenfranchised whose numbers are over-represented in missing and murdered statistics. The original painting is in Toronto, and available for sale, with the artist donating proceeds to the project. If you would like to enquire, please contact admin@artistsoftheaurora.com. The Gone monument was a tribute to the murdered women of Ontario. Designed by Pat Vandesompele, the monument was difficult to construct in that there are no official authoritative lists and so the worry of missing names was ever-present. Two on site visual memorials were part of the Nuit Blanche Installation. Designed by Pat Vandesompele and Steve McKeown, the Away memorial was a metal tree of yellow ribbons for visitors to collect. The installation invited guests to take ribbons to serve as a reminder of the missing women and to they prompt us to look around corridors of power and privilege and ask: “Who is missing?”, provoking us to draw connections between these absences and the phenomena of missing and murdered women and girls. The artists are continuing the memorial, raising funds to record one 15 minute quadrant of the song cycle and inviting artists and musicians from other provinces to engage with “Have You Seen My Sister?” in a bid to raise awareness to reduce the violence against women with evidence-based strategies. The collective is calling for an authoritative list to document the cases of the missing and the murdered women and girls across the country so that the evidence can be analyzed and evidence-based responses to reduce violence can be devised and implemented. For this project, we drew on the lists generated by Maryanne Pearce and her Appendix F for her thesis An Awkward Silence. You can read Maryanne's thesis here. We drew on the lists generated by the NL Feminists and Allies, and we also drew on the work published by the Ontario Association of Interval and Transition Houses (OAITH). We also scoured the internet for updates on the missing and murdered and on the list of Jane Does, and unidentified remains. Update: Dec. 4/17: Link to the most recent version of the OAITH list of femicides for 2016-17. • June 9, 2018. a 30 minute outdoor performance for four voices & drums at the Open Tuning Festival, Toronto, Saturday June 9/18. • May 30, 2018. A 30 minute indoor performance for four voices & drums at the May 29-31 Gathering of Canadian Pluralism in the Arts Movement Ontario, held at Ontario College of Art and Design Ontario. • Sept 30-Oct 1, 2017 (DEBUT). A 12-hour installation for Nuit Blanche Toronto as part of the official program of Independent Projects. Performance was dusk to dawn on Grosvenor Street behind Women's College Hospital. • Dec 6, 2017. A 30-minute indoor performance to commemorate Canada's National Day of Remembrance and Action on violence against women, Hosted at the Centre for Social Innovation, Annex in Toronto. gathering to collaborate on Have You Seen My Sister? Would you like to join us as a singer, reciter or docent for Have You Seen My Sister? Aruna Antonella Handa is a composer and vocalist based in Toronto. Rooted in collaborative and interactive traditions of Augusto Boal, her work often invites engagement, blurring distinctions between artist and audience. As a soloist, Handa has sung with chapel choirs, theatrical productions, a cappella bands, and jazz ensembles. With her current band, The Sirens, she performs her original compositions and song cycles. The band is preparing work for a recording (tentatively called Of Bones & Addicts) due for release in 2019. Born in Tillsonburg, Pat is an import from the tobacco fields of Southwestern Ontario, designing his way through life and into Toronto where he currently lives and works. As a digital media designer, he applies his keen observation and creative problem-solving skills to a diverse range of online projects for national and international NGOs, corporations and commercial ventures. Pat has a background in architectural/interior design as well as graphics, advertising and new media/web development. He brings his design knowledge and intuitive nature to Have You Seen My Sister? as the Visual Designer. Mild mannered Registered Massage Therapist by day, enthusiastic event planner, costume designer, and set decorator by night, Toronto-based Steve McKeown brings his unique style and creativity to a variety of arts projects and can also be found around town volunteering with various arts organizations. Whether designing a fabulous outfit for Pride or unrecognizable as his alter ego with the Triangle Tarts, a troupe of drag square dancers, Steve is equally comfortable behind the scenes as he is stealing them. A designer, photographer and restauranteur, Cher has created and owned several of Toronto's most iconic restaurants, together with partner and husband Ellis Knightingale. The pair have animated spaces in the city evoking romance and ambiance whether of a gilded European style bistro or of a Moroccan desert tent. With an eye for texture, Cher’s photographs reveal dimensional depth, narrate stories and astonish us with fresh angles on familiar subjects. Cher approaches her camera work within a perspective shared between photographer and subject. Cher currently resides in Toronto. Director of the Culture of Cities Centre, Elke Grenzer’s work as a writer, critic, academic and filmmaker focusses on uncovering threads of memory within the fabric of the city, whether in overt monuments or in transitional street art. Under her direction, the CCC has developed a reputation for eclectic and unique programming including the acclaimed international conference series, Scenes of Urban Innovation, recent topics of which include heritage and transition and affective cities. Shelina Knight is an award-winning educator and visual artist, currently based in Calgary, where she engages with youth in art festivals and programs and teaches in the city’s innovative "Learning in and through the Arts” Junior High school. "Art is beauty and truth. The agonizing pain of life truly expressed is its tragic truth. Life’s lilt, elegance, engaging stillness, captivating movement and vibrant colour, create its beauty. Art is the senses tautly stretched on the canvas of human potential and impotence. Art heals through mitigating experience. It is an agent transforming our experience making it more palpable, deeper, more vibrant, or through catharsis breaking the full brunt of life’s pain." Victor has been painting and sculpting for 40 years. Meditation and Tai Chi create a gloss of his subconscious, whose archetypal product he details with brush strokes. Victor resides in Mexico and was born in a Mennonite community in rural Manitoba. That upbringing taught him the importance of truth; Mexico and its culture taught him the value of beauty. Marianne Apostolides is the author of six books, three of which have been translated. Apostolides is a recipient of a Chalmers Arts Fellowship, and the winner of the 2017 K.M. Hunter Award for Literature. Apostolides currently resides in Toronto. Playwright, director, and artistic director of RARE theatre, Judith Thompson is also professor of Theatre Studies at the University of Guelph and an Officer of the Order of Canada. Thompson is the author of 18 published plays, two feature films, and many radio plays. She is also the recipient of many awards including two Governor General Awards, the Dora, and the Toronto Arts Award. Her play, Palace of the End, won the Amnesty International Freedom of Expression Award as well as the Susan Smith Blackburn Award (for best play written by a woman in English in the world that year). Recently, Thompson has been creating professional theatre with marginalized communties in partnership with Soulpepper and the Trillium Foundation. Thompson resides in Toronto. Catherine Nugent is currently exploring opportunities that permit her to dive deeper into her interests in healthcare, green energy and human rights. She is a project coordinator and administrator in her previous lives and currently works out of Toronto’s Centre for Social Innovation. Catherine resides in Toronto. Studying theatre gave Bethany voice and studying yoga gave her resilience. She enjoys sharing both. Bethany continues work in several service modalities and enjoys helping others in whatever way she can. 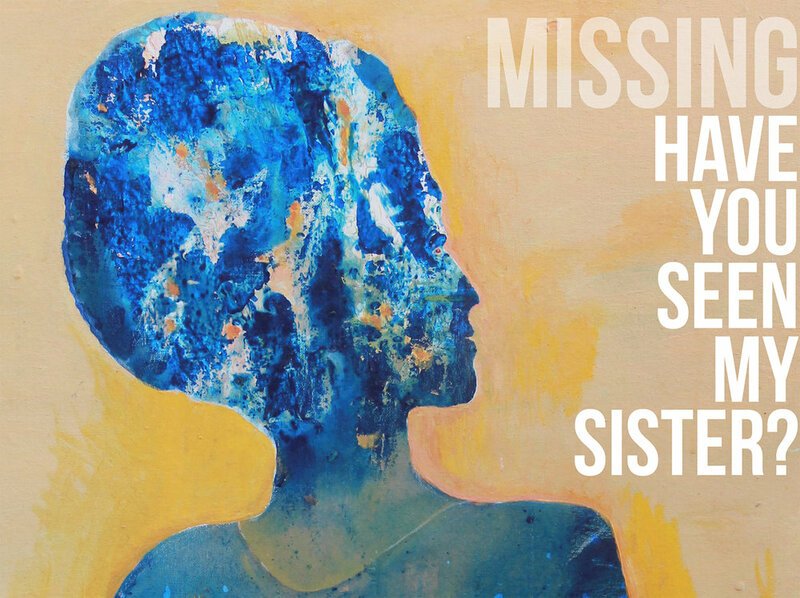 She is thrilled to have an opportunity to honour missing women in Have You Seen My Sister. Bethany currently resides in Toronto. Raised on a farm in Alberta, Haven has been described by friends as "bucolic"; her clown persona Braidy sports overalls and rubber boots. The inspiration for all of her creative endeavours is found deep at the heart of all of her relationships: with her children, partner, parents, siblings, friends, the earth and sky, the stranger on the street, the community, the Creator, and herself. She experiences this condition of being in relationship, and being formed and nurtured by these relationships, as a prerequisite for freedom and a spiritual fountainhead. Haven currently resides in Toronto. Noah Handa-Kipphoff is a man of few words. A composer for more than 15 years, Lindsay has had her pieces and arrangements performed across Canada, the UK and Thailand. As a co-founder of a social enterprise her product has been sold across Canada and in 22 states south of the border. Now, as a consultant, she focuses on the cross-over creativity in arts-based and business-based pursuits. Lindsay is both excited and grateful to be joining Artists of Aurora in this project. Have You Seen My Sister? is a response, through art, to a deeply systemic societal problem. Lindsay currently resides in Toronto. Jennifer Wakefield, soprano, completed a Bachelor of Music in Vocal Performance with George Evelyn at the University of Lethbridge, and then pursued further vocal studies before completing a Bachelor of Education in Secondary Music at the University of Calgary. She relocated to Dar es Salaam, Tanzania for five and a half years, where she conducted the Dar es Salaam Community choir, Chamber choir and participated in the local music scene as soloist and pianist. In Toronto, Jennifer has conducted, composed and led sections, for various ensembles including the Vespera Choir and the Jubilate Singers. She also performs on stage, in an a cappella quartet and in a Celtic vocal and instrumental duo. Jennifer is a native Albertan who currently resides in Toronto where she has been teaching voice for over 15 years. Adil Dhalla is a civic entrepreneur and community organizer who is driven to co-create new and inclusive economies. He is the Executive Director of the Centre for Social Innovation (CSI), the Chair of the Board of the StopGap Foundation and Co-Founder of Camp Reset. Adil was recently named a BALLE Fellow in recognition of his contribution to the new economy. He is the first Muslim to receive the honour. Adil currently resides in Toronto. Noreen (Kirwin) Donnell is a music psychotherapist, composer, pianist, and playwright. She has composed music for theatre, children’s and gospel recordings, events, and radio. In her work as a therapist, she has worked with hundreds of individuals with neurological, communicative, physical, emotional, and psychological challenges. Holding a Bachelor’s degree in Psychology and Music Therapy and a Master's degree in Music Therapy from Wilfrid Laurier University, Noreen has extensive experience working in different settings helping children and adults with developmental delays and physical disabilities, psychiatric and emotional challenges, and children with Autism Spectrum Disorder. Noreen is owner and director of a private practise, MusicByDesign. Sarah Greene is a writer and songwriter living in Toronto. She’s Exclaim! 's Wood, Wires and Whiskey editor and a longtime contributor to NOW. Her writing has also appeared in This Magazine, Quill & Quire, The National Post, Broken Pencil and more. She's released three albums (The Pickups' self-titled debut and Country Houses, City Streets EP and solo album Toronto Blues) and shared stages with Basia Bulat, Abigail Lapell, Oh Bijou, Kat Burns (Kashka), Ron Sexsmith, Don Kerr, Kevin Hearn and others. When not at home writing she’s often at the Tranzac, a not-for-profit arts venue where she works and plays regularly. She is also on the jury for the Polaris Music Prize. Susanna Klassen was born in rural Manitoba, and grew up with 14 (mostly older) brothers and sisters. The mother of three, and grandmother to seven, Klassen is a registered nurse who continues to work at CAMH, despite having retired over ten years ago. Klassen has sung as a chorister in the Pax Christie choir for a number of years, and sees her involvement in this project as a good fit with her active social conscience. Klassen resides in Toronto. Surkhab Peerzada is the Regional Manager for Chronic Disease at the South Riverdale Community Health Centre. She has a Master of Public Health degree from New York University and Honors Health Science degree from the University of Western Ontario. The adage, "think global, act local" continues to bring Surkhab to the field of community health care. She has engaged with unique opportunities in New York City and Toronto, working on projects that support health and well-being of individuals living in underserved areas of these cities. Sarah is an artist, activist and academic, currently working in her hometown of Toronto. When not doing academic work, she sings and writes under the name PhantomFemme. Her music is what she describes as music-theatre punk, and her writing ranges from magic realism to outright fantasy. All her work, though, dances at the intersections of Disability, gender, class, faith/spirituality, magic, and the power of love to triumph over evil and injustice. You can find more about Sarah’s work at www.phantomfemme.com. Lorie Wolf is a drummer, composer and public school music teacher in Toronto. She can be seen playing around Toronto with various projects usually involving sind sort of folk music, probably Klezmer. Alessandra Cerroni is the founder of Mangeons Montreal, a Montreal-based food marketing and event agency, engaging people online and offline with memorable sensorial experiences. Cerroni’s credits include producer, for the Fête des Restos 1st & 2nd edition, Apéro en Chocolat, and Sugar & Spice, and site coordinator/stage manager for the Future Food Salon, the Discovery Gallery, Big Bang Bug Banquet, and the international Eating Innovation Conference (Montreal). She currently resides in Montreal. Judith Cohen is an ethnomusicologist, traditional singer and instrumentalist specializing in Sephardic music, music of the hidden Jews of rural Portugal, medieval music and related traditions, including the Balkans, French Canada, Yiddish, Spain, Portugal, and Morocco; and in inter-cultural projects such as women's frame drums in Portugal and Spain, Jewish and Muslim wedding songs in Morocco, and pan-European balladry. She is the consultant for the 1952 Spain recordings of the Alan Lomax archive, and is working on an authorized edition of his Spanish field diary. Judith holds a master's and a doctorate from the Université de Montréal, in her hometown. An inveterate traveler, she is often on the road doing village fieldwork, and giving lectures, concerts and workshops, in Spain, Portugal, Morocco, Israel and wherever else her work and interests take her. Judith isthe proud mother of Toronto artist Tamar Ilana, who grew up singing and traveling with her. Judith lives in Toronto and teaches part-time at York University. Caitlin Holland is a Toronto based soprano who performs regularly as a soloist and as a member of choirs, as well as with groups like The Fairest and Best. She is the music director at Malvern Emmanuel United Church in Scarborough, and teaches music for young children (MYC),as well as private students. She is very excited to be a part of this important project. Eternal Student. World Traveler. Active volunteer. Sage Tyrtle teaches The Art of Storytelling in workshops and at Seneca College. Her stories have been featured on NPR and CBC radio. Mackenzie loves to sing and play piano. She is an artist with a portfolio that includes, painting, drawing and sculpture. She has been a member of the school choir and glee club and studies music privately. Calgary native Alida Doornberg, mezzo­soprano, is a classical musician with a special interest in contemporary music. Recently, Alida appeared Handel’s Julius Caesar, John Beckwith’s Night Blooming Cereus and the world premiere of Michael Rose’s Northern Lights Dream, all with the Summer Opera Lyric Theatre of Toronto (SOLTT). This coming season, Alida is a soloist and chorus member of Opera in Concert (OIC). Alida is pursuing a Master of Music degree at University of Toronto, studying with renowned soprano Monica Whicher. Alida has trained in Young Artist programs in Vancouver, Calgary, Taos, and Urbania, Italy. In 2015, Alida was a featured soloist at the Rivers Conservatory Chopin Symposium alongside pianist and scholar Roberto Poli. Alida holds a Bachelor's of Music (Honours) in Vocal Performances from the New England Conservatory of Music in Boston. Alida currently resides in Toronto. Debra Scott has been an environmental activist and lobbyist for the past 10 years. She has a strong commitment to research and development on sustainable innovation, and is currently completing her Masters degree at the University of Toronto. She has the Science, Research and Innovation portfolio in the GPO shadow cabinet, ran as the Beaches East York candidate in 2014 and has been nominated as the candidate for 2018. Debra is a certified Change Agent with an extensive background in education, working in Britain and Japan before settling down in the Beaches. Debra is a co-host on the talk radio show “The Women’s Hour” on Radio Regent. Alejandra Ballon is a Peruvian born opera singer who has been steadily building her reputation throughout Toronto since moving here two years ago. Alejandra has a wide repertoire of opera, oratorio and artsongs. One of her favourite sayings is: "If you hold a song dear to your heart, share it with me and I will sing it for you with all my heart!" Alejandra graduated from the University of Western Ontario with a Bachelor in Music Voice Performance (Opera Singing) with Honours With Distinction and as a Western Scholar. Alejandra is drawn to music for spiritual reasons and firmly stands in solidarity with all who have been affected by the ongoing epidemic of missing women. Alejandra is grateful to be an instrument during this year's Nuit Blanche in bringing needed attention to this issue. For Dawn, music is essential to life. They have studied voice and instrumental music (trombone and guitar) as a passionate aficionado, preferring to resort to more mundane work to pay the bills. Last year, they joined the Laurier Alumni Choir and also sang with theUniversity of Waterloo (Grebel) choir under the direction of Gerard Yun for the academic year. Dawn currently resides in Toronto where they sing with the Oakham House Choir at Ryerson. Hindy sings with the Echo Women's Choir. Ellis creates spaces that cultivate imagination: as an artist, an art gallery owner, an entrepreneur developing international consumer products, and as a sought-after designer of showrooms, food retail stores, restaurants and residential contracting. Together with Cher Knightingale, his business partner and spouse, Ellis has built and run some of Toronto's most iconic restaurants, creating astonishing spaces in which to imagine and recreate the city. Ellis lives in Toronto with his wife Cher, their daughter Teya, and their two cats. Anne Stanley has been singing with Echo Women’s Choir for over 20 years and she has also been the Administrator of Echo since 2009. Annika is a 20-year-old singer/songwriter/rapper/producer who performs different genres including indie, hip-hop, and rock. In 2014, she and her friend started a folk-rock duet named D’N’A. She has performed at festivals, school events, and venues in Toronto. She has also played at the Harbourfront Studio Theatre & Redpath Stage as part of NXNE. She received a demo grant from FACTOR Canada in 2015 and recorded a song, “Brave New World”, released on Spotify with producer Karen Kosowski. Heaven is a singer/song-writer also known as Shernice B. She has studied music at the Ontario Conservatory and has performed in school ensembles throughout her education. Inspired by Bobby McFerrin's "Don't worry, be happy", Heaven has recorded her own a cappella tunes and is currently writing songs for an upcoming album project of original material. Heaven resides in Toronto. Luciano Iacobelli is the author of The Angel Notebook (Seraphim Editions, 2007), seven poetry chapbooks and two full length plays, The Porch and Byrdbrain. He is also the publisher, editor and designer of LyricalMyrical Press. Echo Women's Choir celebrates 25 years of singing! Echo is a 70-voice community choir, open to all women, all ages, all cultures and professions. The choir aims for inclusive membership, a rich and varied repertoire, musical excellence and passionate expression. From original and local compositions to traditional community singing from around the world, Echo offers its audience the liveliest and richest possible repertoire, performed with open-hearted, full-body musicality. We celebrate our city’s astonishing diversity in our music and our voices. We work towards harmony, holding up strong, varied and vibrant culture in our singing community. Led by Becca Whitla and Alan Gasser as a non-auditioned choir, firmly dedicated to remaining accessible to all women. www.echowomenschoir.ca. Grace Thompson is a writer, performer and visual artist. Grace writes and performs poetry and has written several plays. She has been involved as both a writer, and actor in the Toronto Fringe Festival, Luminato, SummerWorks, Paprika, and The Muddy Mary Project. Grace's most recent play My Nightmares Wear White was performed at the CAPHC Conference in Halifax, the EPIC Conference in Calgary and will be touring Canada in 2018/2019. Grace holds a degree from University of Guelph in Theatre Studies and is also a graduate of Humber’s Theatre Performance Program. Grace resides in Toronto. Richard was born in Hamilton and raised in Montreal. He attended the University of Western Ontario. He worked for 25 years in advertising and is now pursuing a new career in real estate and property management. Richard currently resides in Toronto. Just a kid from North Bay who fell in love with songs and the things with strings one needs to make them, Collette Savard has made the best of her time chained inside the Tower Of Song. Savard independently released three albums with her long time partner, producer and multi-instrumentalist John Zytaruk (Most Improved Cheerleader, 2005; Zen Boyfriend, 2008; Best Dress, 2012). It is now her great delight to be releasing her first album (due January 2018) with her Cadillac of a band, The Savants, featuring backup singer/percussionistRebecca Campbell (Jane Siberry, Ian Tamblyn...), bassist and producer John Switzer (Jane Siberry, Vance Gilbert, Katherine Wheatley etc.) drummer Martin Worthy (Joe Hall, Paul Quarrington), guitarist Tim Posgate (So Long Seven, The Cluttertones...) and keyboardist Megan Worthy (her dad Martin Worthy! Among many other Toronto bands). Collette currently resides in Toronto. Honoured to be a part of Have Seen My Sister, social media influencer Tyler Ennis is inspired by local community projects and events that showcase amazing spirit. He believes these are achieved every day in the neighbourhoods of the great city of Toronto and that they deserve media attention. Aspirations include creating an online channel featuring local events and the local businesses who support them. If you are involved in a local community event such as #HYSMS reach out to @myblocktyler on Twitter or Instagram. If you'd like more information about us, to schedule an interview or to join us, please email us or telephone us 416.606.0799.